This 2015 children’s picture book is simply a visual and literary masterpiece. 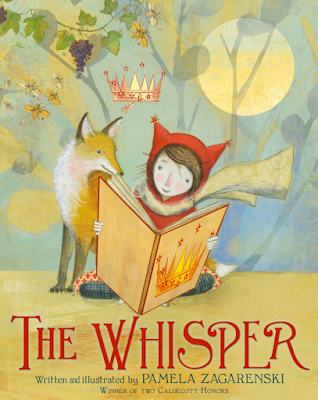 Children of all ages and their adult companions are invited into a fantastical golden world with a little girl in a red hat who once was given a special book for a day. She soon discovers that many of the words just aren’t there. My favorite illustration shows this girl, so excited to read, running home with her book in hand as the words fly away, in the shape of birds migrating, only to be caught in a butterfly net by a fox. Zagarenski’s landscapes of overlapping shapes, light, and color in a palette reminiscent of Gustav Kilmt give us time to breathe and wonder. Where are the stories, the little girl wants to know. Along with a lion, a rabbit, bees, bears, and other appealing creatures, she opens her book and reads page after page of beginnings. In a whisper sent to the girl by the wind, she is encouraged to make her own stories: “Start with a few simple words and imagine from there.” And, like the girl, we realize that we, too, can create our own beginnings, middles, and ends. Story-making is for everyone.